From Quantum Mechanix. 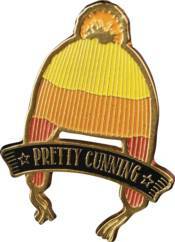 Our Firefly Pretty Cunning Lapel Pin let you channel roguish mercenary Jayne Cobb without messing up your hairstyle. Enameled in yellow, orange, red and black, its fine details show off Ma Cobb's handiwork and lets the Verse know you are pretty darned cunning. Jayne will be growling with pride over this favorite piece of headgear, and we suspect, so will you.